UNICRI and ICC BASCAP released a new report advocating the confiscation of the proceeds of crime as an effective tool which governments can implement against the infiltration of transnational organized crime into the illicit business of counterfeiting and piracy. 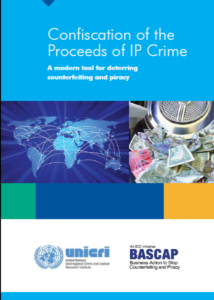 UNICRI and BASCAP release new report on combating IP crime. The report, Confiscation of the Proceeds of Crime: a Modern Tool for Deterring Counterfeiting and Piracy is the outcome of collaboration between UNICRI (United Nations Interregional Crime and Justice Research Institute) and BASCAP (Business Action to Stop Counterfeiting and Piracy). The report is the joint response to the growing evidence that Intellectual Property (IP) crime has emerged as a lucrative and growing business for organized criminal networks due to the high profit and low risk it poses compared to other crimes. The report is being presented at the Seventh Global Congress on Combating Counterfeiting and Piracy held in Istanbul, Turkey from 24 to 26 April 2013. The report examines legislation dealing with confiscation of Proceeds of Crime in the United Kingdom, Australia, Italy and Switzerland, highlighting the best practices from these countries and providing a detailed set of recommended legislative provisions. The report provides a model for governments to establish effective Proceeds of Crime regimes against a growing global concern. While the report recognizes that laws providing for the confiscation of Proceeds of Crime have been in place and used effectively to deal with other organized criminal activities, it reveals that not all countries have adopted and implemented Proceeds of Crime laws to address intellectual property crimes. “Many governments have not fully recognized the increasing role played by transnational organized criminal networks in the trade of counterfeited and pirated goods, or the risks of their infiltration in the market and the economy,” said Jeffrey Hardy, Director of ICC BASCAP. “Along with UNICRI, we hope that this report will generate greater awareness amongst policy makers of the importance of the Proceeds of Crime legislation, and that the inventory of key legislative provisions and best practices will encourage and support the effort of national governments to establish or enhance a Proceeds of Crime legal framework,” Mr Hardy added. The report advances that the emerging role of organized crime is helping to accelerate the globalization of counterfeiting and piracy, which in turn helps to fund other criminal activities such as extortion, illegal drugs and human trafficking, and generates money laundering which compromises the international financial system. In addition, the report highlights that the confiscated proceeds of crime can be reinvested in further law enforcement activity, defraying the related public costs and supporting the protection of intellectual property rights often compromised by competing demands and overburdened government budgets. “Not only are proceeds of crime laws effective deterrents, but governments can reinvest confiscated proceeds of crime to help law enforcement pay for itself,” said Mr Hardy.